Sports Costs > How Much Does a Deer Mount Cost? How Much Does a Deer Mount Cost? 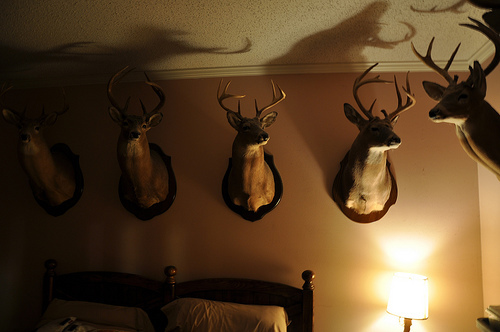 Those who deer hunt may, once in awhile, shoot a buck worth mounting inside their home. While most people tend to mount a buck with more than eight points, it really comes down to a personal preference since a taxidermist will mount anything you bring their way (as long as it is legal). The cost of mounting a deer is going to depend on the taxidermist, the type of mount required, the size of the deer, the inclusions and geographical location. For a standard shoulder deer mount, plan on spending anywhere from $350 to $600. This cost, as mentioned above, will depend on the size, where you live and the taxidermist you choose. Plus, based on the extras mentioned below, this range can be much higher. A half body can cost anywhere from $650 to $1,100, while a full body mount can cost anywhere from $1,300 to as much as $2,300 depending on the size of the deer. An antler mount can cost anywhere from $30 to $100, while just the head mount can be between $250 to $450. For example, RN Taxidermy located in Davison, Michigan charges $350 for a shoulder mount, $750 for a half and $1,400 for a full body. On this Field and Stream forum thread, most members claimed they paid anywhere from $200 to $450 for a mount with the hide and antlers on. If you would like to purchase a deer mount that has already been done and is not from a deer that you hunted personally, it can cost anywhere from $350 to $1,000 depending on the type and size of the deer. A deer cape can cost $85 to $225, depending on the size. A European mount, which involves cleaning and whitening the skull, can cost about $100 to $250, depending on the plaque you use. We contacted and/or viewed a viewed a few taxidermist’s websites throughout the United States and posted our findings below. A taxidermist will include the full cleaning, skinning, as well as tanning if this option is chosen. A taxidermist will mount it to a plaque of your choice. A lower-end mount will typically include a dry preserved cape, fewer details and limited pose choices, whereas a higher quality will include a professionally tanned cape, extreme details to make it look lifelike and more poses to choose from. Popular poses for mule and whitetail deer include the semi-sneak, full sneak upright and pedestal. Common mount material choices, when mounting just the antlers or skull, will include oak, walnut, cedar, camo, cypress, weathered wood or mesquite. If you want to have the deer tanned, which is the process of darkening the skin, can cost anywhere from $100 to $200 extra. Antler mounts can be done in many ways. For example, the antlers can be shaped in form of a light that can be hung, and these lights alone can cost $150 to $200 for the lighting kit alone. Higher end plaques, such as those made of solid oak or walnut, and customized nameplates can cost more than the basic mount a taxidermist generally provides. Higher quality wood can increase the price as well. Taxidermists can give the illusion of a 3D background where the head is mounted. Something like this can start at $100 and go up from there depending on the complexity of the design. If damage has been done such as bullet wounds, a broken skull, scrapes or the hair has been worn down, this can be repaired for an additional fee. Most taxidermists will charge anywhere from $30 to $65 per hour. Most jobs should be less than $250, however. Rush services may be available with some taxidermists, and if it is available, it will come at an additional fee. Be wary of cheaper taxidermists. When shopping, don’t focus solely on what they are going to charge; instead, focus on their work of the past. Ask to see samples, talk with previous customers and don’t forget to look at reviews online. When looking at these samples, pay close attention to the nostril detail, the alignment of the hair and the eyelids, then ask yourself: Does it look natural? Pinterest has thousands of deer mount ideas if you don’t know what you want to do with your deer head. Consider mounting deer antlers yourself. There are various kits online that can cost anywhere from $15 to $35 per kit. Simply follow the instructions to mount the antlers. If you want to purchase a deer mount from someone else’s hunt, highly consider purchasing them used on sites such as eBay or checking local Craigslist ads.